age-well.org > prevent age related diseases > what is sarcopenia? Sarcopenia may sound like a political condition suffered by French nationals opposed to the regime which lost the elections in May 2012, but actually it is a mainly preventable, age-related, medical condition which can affect the aging population of any nationality or race. Sacropenia is the gradual loss of muscle mass which can often be disguised by an increase in fat in and around the muscle. Although the first signs of Sarcopenia may begin to show after the age of 40, the condition usually starts to accelerate after the age of 65, and progresses even more rapidly as the individual ages, unless specific measures are taken to prevent its development. However, Sarcopenia begins to develop long before we begin to notice its effects. When we observe that athletes begin to lose their edge as early as in their twenties, we can conclude that the process starts at this time, probably as soon as the individual stops growing. The condition appears to be caused by a combination of several factors, including poor nutrition, lack of exercise and decreasing hormone levels. Sarcopenia is usually age-related muscle loss, although it can also be caused by injury, HIV, or by multiple sclerosis and other wasting conditions. As a person ages the building of new muscle becomes increasingly difficult. 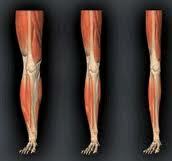 Muscles also lose their ability to regenerate after injury or though strain due to over exercising. Because of this, aging patients take a much longer time to recuperate fully than their younger counterparts, when muscle mass is lost due to limbs or the whole body being immobilized to help broken bones to mend after an accident. Lack of exercise results in a loss of muscle mass and this in turn leads to a loss of strength. Loss of strength and poor balance are two symptoms with aging that can result in falls which could have been avoided if the person had been in better condition. The result in individuals who have lost bone mass as well as muscle mass can be broken bones which can ultimately lead to loss of mobility. It is therefore important to take measures to prevent Sarcopenia before it reaches the stage where it can cause falls and lead to invalidity. Fortunately, with the right amounts of appropriate exercise, including weight bearing exercise and resistance training, Sarcopenia is partly reversible. Although Sarcopenia is mainly found in sedentary individuals, it can also be found in people who are physically active and who have been so throughout their lives. This indicates that exercise is not the only factor contributing to this condition. Current research bears this out and indicates that Sarcopenia is caused by several different factors, including physical inactivity. These include poor nutrition, decreased ability to synthesize proteins and decreasing hormonal levels. Inadequate nutrition may also play a part in the development of Sarcopenia in the elderly, as this is an age-group which notoriously do not eat well, especially when living alone. Insufficient protein intake is often the main culprit, particularly in individuals who are struggling to manage on a low income. Hormone levels also decrease with age which can result in the loss of muscle mass and an increase in fat deposits. Human growth hormones decrease from approximately age 25 and testosterone levels decrease in both men and post-menopausal women. The latter also experience a decrease in estrogen which is partly responsible for the increase in fatty tissue, especially fat around the middle. Remember, even when a sportsman or woman ceases to exercise, their muscle mass decreases, their metabolic rate reduces and excess calories start to be stored as fat. One can imagine then, that the degree of muscle-loss in a non-athlete, especially one who is aging, is going to have far greater consequences and be more difficult to rectify. Therefore, any Sarcopenia prevention or treatment program needs firstly to avoid the loss of muscle by atrophy and secondly to avoid the accumulation of fat. It should also aim to recuperate lost muscle mass if at all possible. This can be done through exercise, nutrition and carefully controlled supplementation. If you think you have Sarcopenia you should make an appointment to see your local general practitioner (GP) who may refer you to a specialist. in the meantime or to prevent the condition, please follow the advice on our page on the prevention and treatment of Sarcopenia.